Hey, y’all! We can’t believe June is over. Karl’s been out in CO for a month now and things have been going well so far, so thanks for your prayers. Those taking Biblical training classes have just finished their first two weeks (out of four) and after that all of our US staff will arrive for the big conference. We’ll save our stories ‘til next month since the biggest part of the work is yet to come, but would love your prayers, not just for the technical stuff to go well, but for God to use the time to work in all of our lives as each person needs. In the meantime, we thought you’d love to hear a follow up story about what God has done since one of Keynote’s summer project students was with us last year. Graduation parties and big changes flood this time of year in students’ lives. And through your partnership with Keynote, we impact the lives and spiritual formation of college students – even beyond graduation. Purdue University’s class of 2013 includes Stephen. After graduation, he plans on finding a job as a cameraman with a news crew, building relationships with his co-workers and sharing the love of Christ with them. Before he spent last summer at Keynote, however, his plans were completely different. God used Keynote’s 2012 Summer Project to change Stephen’s heart and plans, impacting not only Stephen’s life, but the lives of the people around him. But the changes didn’t end there; even the way Stephen approached life was challenged. For example, John and Pam, the leaders of the film team, surrendered everything to God and trusted Him in even the smallest details of the film. “It showed me how to integrate my faith instead of compartmentalizing it,” says Stephen. Through those lessons, God opened Stephen’s eyes to how his life could be different than he expected. 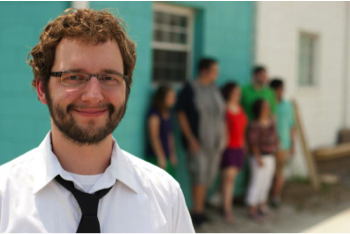 Returning to Purdue, Stephen integrated his faith into his friendships, classes, and work. His focus moved from himself and his own success to noticing and loving others. Chris, one of Stephen’s co-workers, saw a difference in his attitude. When Stephen showed Chris Overboard, it started a series of spiritual conversations between the two of them. And since then Stephen has also started conversations with other Purdue students and with friends from high school by introducing them to Overboard. It’s a blessing to be a part of the life change that God starts at summer project and continues as the students move on to find jobs and build relationships. Please pray with us that all of the past summer project students would continue to be changed by what God began at Keynote! This entry was posted in General on July 3, 2013 by Liesl.